홍교란 다리 밑이 무지개같이 반원형이 되도록 쌓은 다리를 말하며, 아치교·홍예교·무지개다리라고도 한다. 이 다리는 현재 남아 있는 홍교 중에서 가장 규모가 크며, 현재도 주민들이 사용하고 있다. 예전에는 이 자리에 뗏목을 이은 다리가 있어 벌교(筏橋)라는 지명이 생겨났으며, 조선 영조 5년(1729)에 선암사의 한 스님이 돌다리로 만들어 놓았다고 한다. 그후 영조 13년(1737) 다리를 고치면서, 3칸의 무지개다리로 만들어졌고, 1981∼1984년까지의 4년에 걸친 보수공사를 통해 지금에 이르고 있다. 무지개 모양을 한 다리밑의 천장 한 가운데 마다 용머리를 조각한 돌이 돌출되어 아래를 향하도록 하였는데, 이는 물과 용의 관계에서 오는 민간신앙의 표현으로 보인다. 예전에는 이 용의 코끝에 풍경을 매달아 은은한 방울소리가 울려퍼지도록 하였다고 한다. 다리가 놓여진 강에는 바닷물이 드나드는데, 썰물 때에는 다리 밑바닥이 거의 드러나고, 밀물 때에는 대부분이 물속에 잠긴다. 원래 다리의 규모는 폭 4m, 길이 80m에 이르렀을 것으로 보이며, 이 다리를 위해 주민들이 60년 마다 회갑잔치를 해주고 있다고 한다. 화려하고 거대한 모습 속에서도 단아한 멋을 풍기며, 웅대함과 함께 뛰어난 기술을 엿볼 수 있는 대표적인 작품이다. 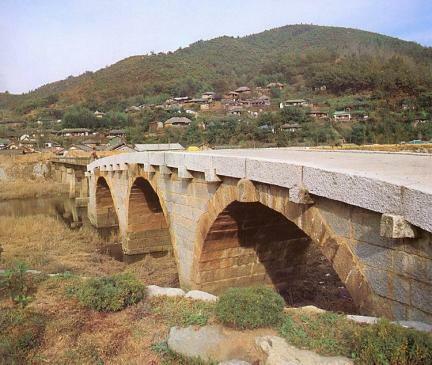 A Honggyo Bridge indicates one that has an arch-shape looking from underneath like the rainbow. 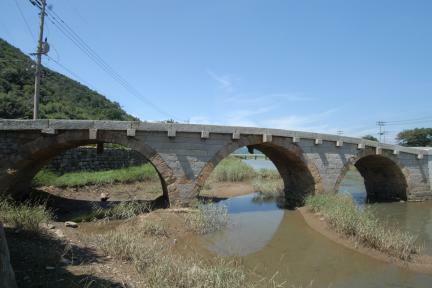 It is also called an arch-bridge, Hongyegyo Bridge or Rainbow Bridge. 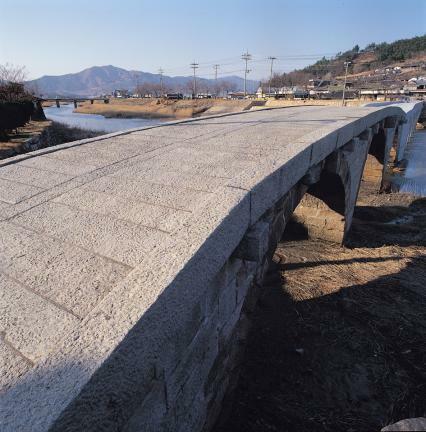 This is the largest of the rainbow bridges still standing, and people still often cross it. 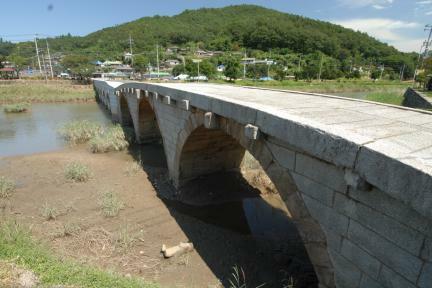 In the past, it is said to have been called Beolgyo, because it used to be a raft bridge. 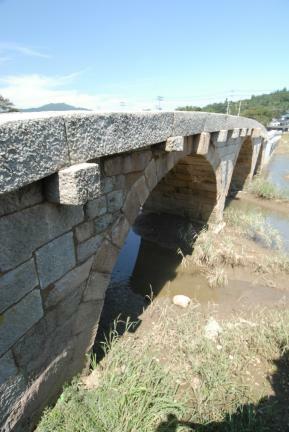 A monk from Seonamsa Temple made it as a stone bridge in the 5th year of the reign of King Yeongjo (1729) of Joseon. 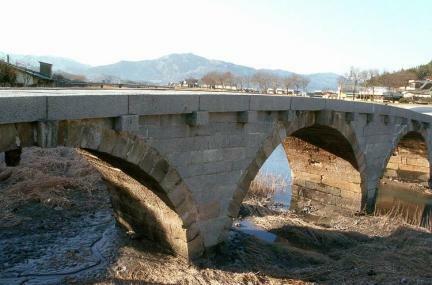 In his 13th year (1737), the bridge was repaired and rebuilt as a three-arch rainbow bridge. 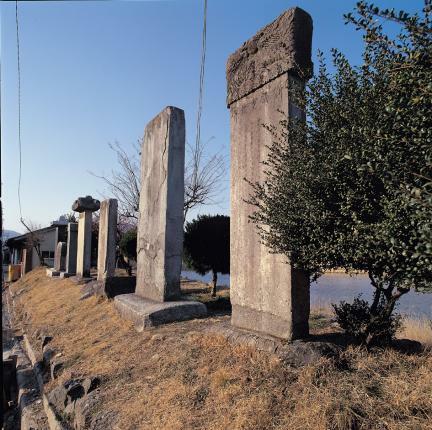 Through a four-year reconstruction from 1981 to 1984, it took on its present look. 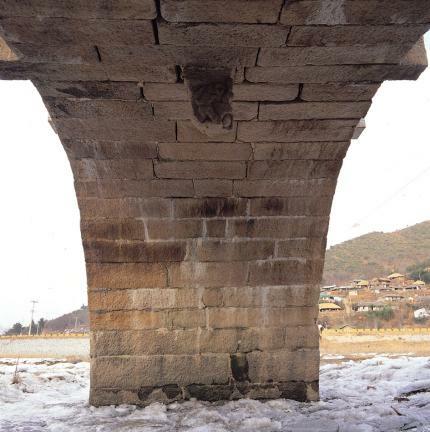 Under the bridge, in the middle of the ceiling, the stone is engraved with a dragonhead which protrudes and faces the bottom, symbolizing of a folk belief about water and dragons. 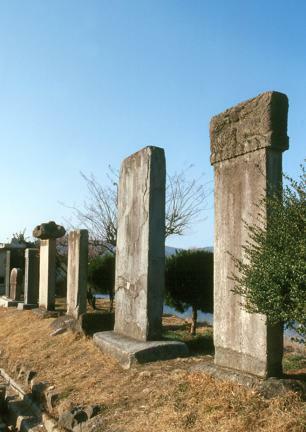 In the past, a wind-bell was laid on the dragon’s nose to reverberate. 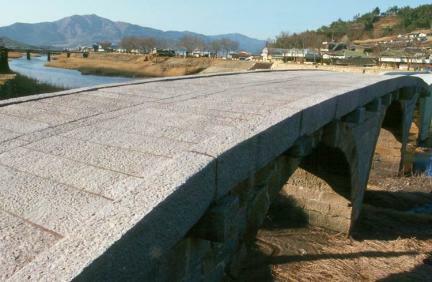 The river that flows under the bridge is connected to the sea. 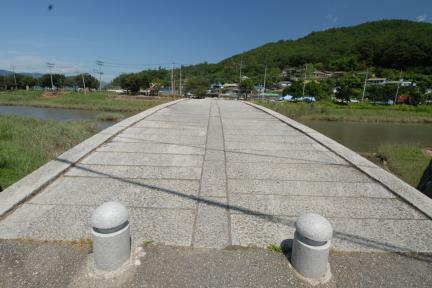 The river bottom is visible at a falling tide, while most of the bridge is flooded at a rising tide. 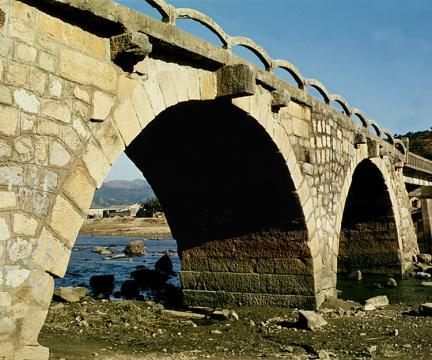 Originally, the bridge was estimated to be 4 meters wide and 80 meters long. Its appearance is grand though simple. It is considered a magnificent work with a beautiful shape and displaying exceptional skills. A banquet has been held every 60 years for its 60th anniversary by the village people.